So the end is in sight for the Fianna Fail - Green government which has been on its sick bed for months. The Greens finally withdrew at the weekend, citing problems about "uncertainty" and "lack of consultation". The fact is that they should have left this government several years ago and in my view should never have entered it in 2007. The party has lost many of its best members as a result of the increasing compromises which the Green ministers and TDs (MPs) made. I had written articles in US and Australian journals criticising the position which the party adopted from 2008 onwards and also organised a fringe at the GPEW conference in Hove where a former Green councillor, Bronwen Maher, spoke about what had happened within the party. February 25th now seems to be the date for the general election. But the opposition parties, including the Greens, have agreed to a shabby deal, where the Finance Bill, which among other things will reduce the minimum wage, will be rushed through both houses of parliament within less than a week, so that no vote of confidence in the government needs to be called. This is a real attempt to shortcut democracy because the people should be allowed to vote first on the type of economic decisions they want made in their name and the new government with a democratic mandate should make the decision. We can see from this that Fine Gael and Labour, the likely government partners, will continue to push through the neo-liberal policies designed to crucify the Irish people as a result of the EU/IMF bailout of the toxic banks. Only Sinn Fein will vote against this in the Irish parliament this week. Joe Higgins the Irish Socialist Party MEP put the point very forcefully to Barroso, President of the European Commission, in a recent debate in the European Parliament. As Paul Mason, the BBC Economics Correspondent, recently remarked: "The Irish face a generation of penury." With people leaving the country at the rate of 1000 per month, the outlook is grim. 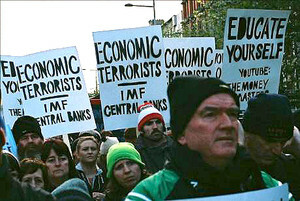 I can only hope that the parties of the Left do well in this election and that they reject the massive reparations laid down by the IMF and the discredited Irish political elite for the Irish people to pay. The current view of the Irish politicians is best summed up in this comedy clip of a supposed interview involving the Fianna Fail Minister for Finance, Brian Lenihan and the Labour TD, Joan Burton.